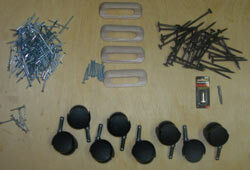 We are often asked about the contents of our hardware kits. We strive to furnish the highest quality hardware at very competitive prices. You can order our plans and buy all of your hardware locally, but on average it won't save you any money and it will not be the same high quality, furniture grade hardware that we sell in our kits. The main furniture lags that will be plainly visible on your new bed, are made from hardened steel and are black plated so they look nice. The screws that we furnish are factory assembly screws and are far superior to common, drywall screws in finish and break resistance. Below are some pictures that might be useful in making your decision. 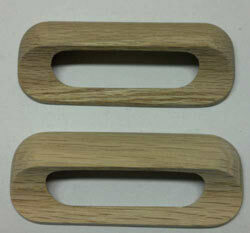 We furnish the hardwood dowel pins for stacking your bunks if that is the model that you choose. The casters that we sell are heavy duty carpet casters that are rated for hundreds of pounds each. 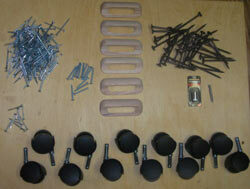 Our kits with drawers and trundles have wooden handles and the screws to attach them. The 4 inch lags we sell are far superior to the lags available at home centers. They are hardened steel and black plated. We also furnish the tool to install them. 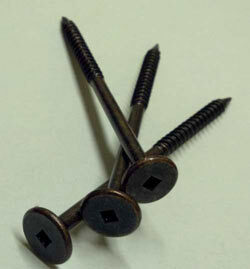 These are the common lag screws that we recommend if you choose not to purchase our hardware kit. 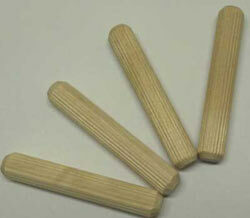 They are very durable and will hold up for many years. We prefer the look of the ones on the left.